These Hazelnut Chocolate M&M's are every Nutella lover's dream come true. There is only one problem with Nutella. The addictive, creamy chocolate-hazelnut spread from Italy always tastes amazing (whether spread on toast or eaten right from jar) — but it's incredibly messy to eat. The makers of M&M's have finally come up with a solution to this very important, must-be-solved problem. On Tuesday, M&M's announced that it is coming out with Hazelnut Spread M&M's. OK, so the chocolate maker is not going to be using authentic Nutella in its candies, but the brand got things so right with its Caramel M&M's last year, so hopefully they will develop a new creamy filling that blows everyone away ... again! TODAY's Hoda Kotb and Kathie Lee Gifford got a chance to taste the new candies on Wednesday. Kathie Lee isn't a fan of hazelnuts, so she had Hoda taste test them. "Mmm ... wow!" Hoda said about the blue candy-coated chocolates. Other early testers of the new flavor said that the candies had a "creamy chocolate-hazelnut center" but that they "missed the mark" and "tasted just like popcorn, oddly enough," according to The Daily Meal. 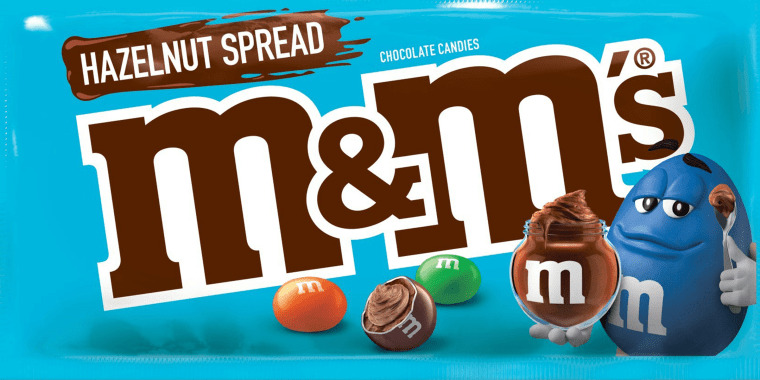 The Hazelnut Spread M&M's won't be available on store shelves until April 2019, but this might not be such a bad thing. Although Hoda really liked the candies, maybe the other early testers got a bad batch ... but, if not, there's still time for the company to tweak it's formulation if the other early taste testers are correct. Although most people will have to wait until next year to try the Nutella-inspired candies, there are other new products coming out that many will be able to try sooner — and Hoda and Kathie Lee raved about them. Mars is coming out with five new chocolate bars made with mini M&M's in different flavors. For classic M&M's enthusiasts, there will be a milk chocolate version. Then there are two flavors that have nuts added: peanuts and almonds, specifically. Another bar will have crispy rice added in addition to the mini M&M's. "That's a winner," Kathie Lee said after taking a bite. "Oh my god ... mmm," Hoda said. The last bar will be also have crispy rice added, plus mint-flavored mini M&M's. The bars are coming out in December, but people are already getting pretty excited about them on social media. "This is literally the most exciting thing I've ever seen...I want this for Christmas and Valentine's and my birthday and Halloween," one person wrote on Facebook on Tuesday, just after the announcement was made. "Thank you for giving me a reason to live!!!!!" wrote another. In addition to releasing the Hazelnut Spread M&M's in April 2019, next year will also bring three new Peanut M&M's flavors: Mexican Jalapeño, Thai Coconut and English Toffee.